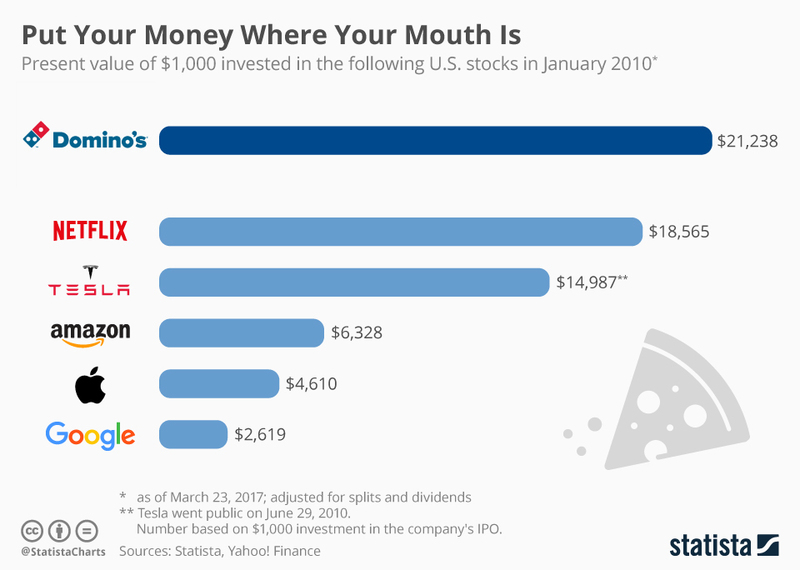 Why you should have, “put your money where your mouth is” and invested in the non-tech winner that is Domino’s Pizza instead of in all of the tech titans that we think of today. How did a company that, at first glance, is inherently not related to tech, manage to utilise technology for such huge value creation for its shareholders? 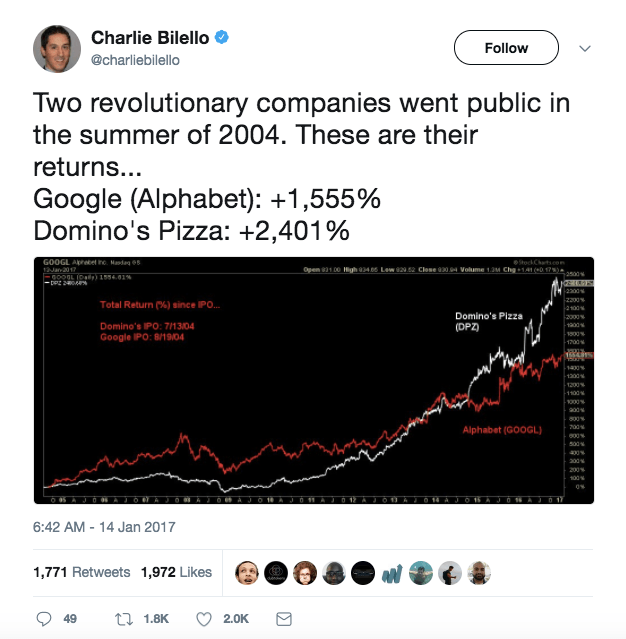 Sure, Domino’s is aided by the fact that pizza is not a fad food and unlikely to go out of style, but this also means that unlike Google, Domino’s is playing in a crowded market, where as Google is playing in a winner-take-all market, making Domino’s value capture even more impressive. It was the management team’s dedicated focus to integrating a cohesive technology strategy across the company that has allowed it to be so successful. Domino’s focus has been on removing any barriers to purchase for consumers – just look at how a person can order from Domino’s today, via the mobile app, by tweeting at the company, or by texting an emoji of a pizza! The Domino’s management team was cognizant of the fact that Domino’s is both a pizza manufacturing company and a pizza delivery company and that part of a positive consumer experience is receiving the pizza as soon as possible and to have it be piping hot. A great deal of innovation has gone into gamifying this process – with the Pizza Tracker giving the customer real time updates on her pizza and making her feel informed – as well as R&D developments that are in the works for the company. 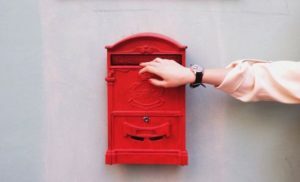 Examples of these are the Domino’s Robotic Unit, (DRU), an autonomous vehicle that would be able to deliver pizzas to customers’ homes without a driver, lowering costs for the company if the DRU can reach scale, adding an element of interest and excitement and meaning that delivery can happen 24/7. As well, Domino’s created a GPS Driver Tracker which allowed the company to ensure that their drivers were safe but also to gain insight and analytics into how the drivers were spending their time enabling management to create route improvements and efficiencies to increase the number of deliveries that each driver could make in a shift. 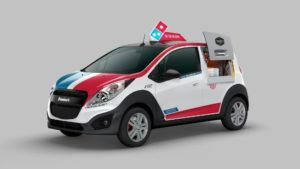 Domino’s recognised that the transportation of the pizza was not only the key to a successful customer relationship, but also an excellent marketing moment, and so Doyle, the CEO, set up a crowd-sourcing campaign to create an auto design for the Domino’s delivery car, thereby building brand loyalty and consumer awareness as well as a tangible asset for the company – the design – in one crowd-sourced interaction. The car was especially innovative as it had only one seat in it and the rest of the space was filled with a warming oven that could hold up to 80 pizzas allowing the driver to deliver a much larger number of pizzas in one delivery run than before. 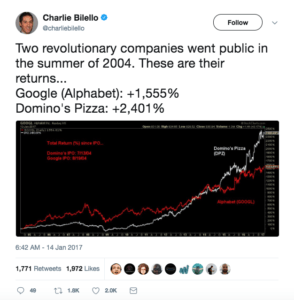 Russell Weiner, Chief Marketing Officer at Domino’s, made the company’s commitment to innovation and change very clear when he said in 2010 after the wildly successful launch of the company’s new pizza recipe, ““It’s quickly going to be no longer relevant to consumers what our pizza used to be,” he says. 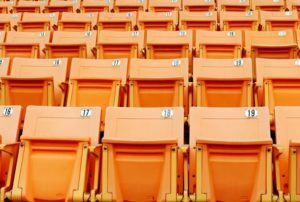 “But will there continue to be news and change from this brand? Absolutely. 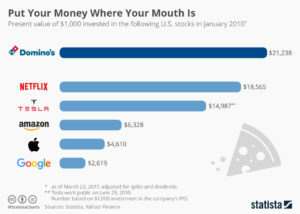 It’s how you stay relevant with consumers…There are more chapters in the story that we haven’t told yet”” Domino’s dedication to using technology to innovate and to stay at the forefront of its category has allowed the company to be a true winner in a space where most of its competing brands are falling behind and at risk of becoming irrelevant in the face of digital technologies. While Domino truly embraced one of two key parts of its operating model – transportation, this success story probably would not happen without company changing its other part – pizza production, when Patrick Doyle joined as a new CEO in 2010. Company was open to criticism and learning and managed to dramatically improve pizza quality, while starting investing in technology. Domino’s recent strategy is a great example of harmonious marriage of technology and quality through listening to its consumer. Interesting topic. 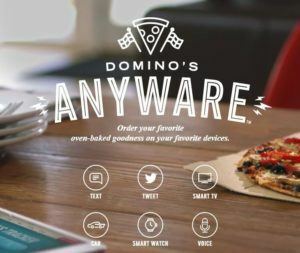 It is hard to allocate Domino’s success to its improved technology or its improved pizza quality, but it is great to see a CEO make changes to grow the business across multiple fronts. While Domino’s has taken a bet on self driving cars, their competitor Pizza Hut also announced a $130M investment in technology and advertising at the end of 2017. Their first announcement was a new pouch and delivery system that promised to deliver pizza 15 degrees hotter. It will be interesting to see how these competitors continue to create and claim value in the future.